I heard an eitzah today that I want to know what the olam has to say about it. Sometimes the klaf takes in the dio too much that even if one is able to erase what's on top, still there is a roshem left on the inside that cannot come off. Could someone take white-out (here in Eretz Yisrael they have typex which I think is the same thing?) put that over where the part to erase was, be m'shafshaf a little bit where the typex is then write over it? What about chaziza betweem the klaf and the dyo? Where does it say chatzitza is a problem? Why would it be a problem? L'maseh what do they put on the klaf in the process of making it? What do you mean by 3 - 12? 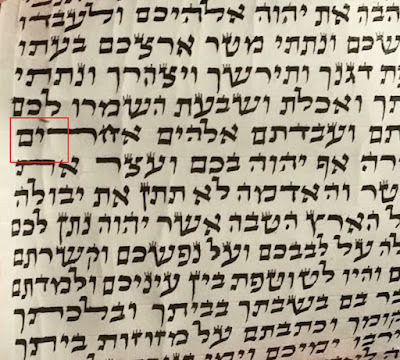 Many use chalk (gir) instead, see the Mishnas hasofer p. 17 heara 46 that gir is not a chatzita (it is often applied on the klaf so the ink should not spread), it also whitens the area. just erase it after applying. Here's a trade secret: Use chalk as Dovid suggests.It will clean it up and make ut easier to write on, and it is not a chatzitzah. Then, after its dry, spary with fixitive. It will stop the chalk from coming off and keep the mechickah looking nice long term. 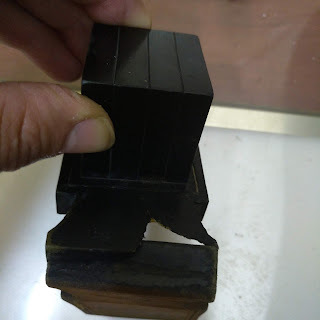 Here is a topical question: If a magiha fixes up an ugly mechikah on a mezuzah using chalk, and the chalk goes on a letter or two, making it faint and basically not legible, is it lo kesidran for him to go over it with ink, or can he rectify only by removing the chalk? I asked R' Shammai the shailo today and he quoted me the Keses HaSofer mentioned above with the Lishcas HaSofer (Siman 2 Sif 12.) I mentioned to him chalk and he said it's not such a good eitzah because it comes off too easily (very "powdery".) He preferred this since it stays on better. If I remember I will raise this point. However I think it goes back to what has been mentioned in the past that if the chalk comes off easily there is no shailo of c'sidran. Seemingly that would be the better thing to do to brush off the chalk. Dovid,Instead of erasing after applying the chalk;wouldn't it be better to work it in the Klaff with a smooth piece of sandpaper? 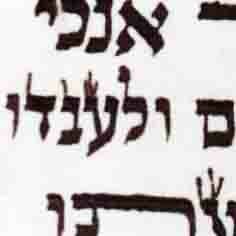 the purpose is not to whiten the klaf rather it is that the ink shoul not spread.